All was going good in Rajnish's family , a humble family of four members. Arohi was enjoying her early childhood like any other normal kid and family was feeling blessed to have her. She is a sweet kid full of joy and dreams. But fate took a wrong turn in year 2015. She started falling sick frequently. After multiple diagnosis and investigations, Dr. revealed horrific news of her Kidney Cancer. This was devastating news for family. Both parents were broken but decide they will try everything for her. They are trying best to keep her alive. She isn't aware what is wrong with her. At this tender age, she has been operated thrice and one of the kidney has been removed. She is a brave girl and giving a tough fight to deadly cancer. Her father Rajnish is working in a private company on salary of Rs. 10,000. So far total Rs. 11 lakh have been spent by him since year 2015. He has already exhausted all available help. Now, in desperate need to keep his daughter alive. Rajnish has another sad news, a month ago his eight year old boy also complained about pain and blood in urine. Doctor has diagnosed genetic Kidney Disorder that impacts kids in very rare case. 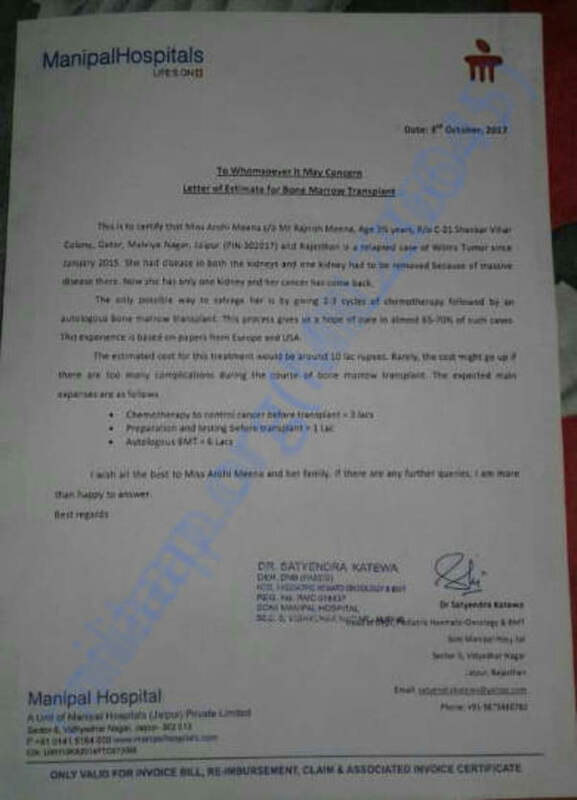 As per Dr., his son's kidney may get impacted and need transplant in future. When the time to play and enjoy, both siblings are going for frequent Dr. Checkups. There is hope that both of the kids can survive with timely surgery and medical assistance. But that needs lot of financial support. The Hospital where presently Arohi is been treated has quoted 10 lacs cost for Chemo, Transplant and other Medical Examinations to cure Aarohi. I appreciate if kind people like you come forward to help him . 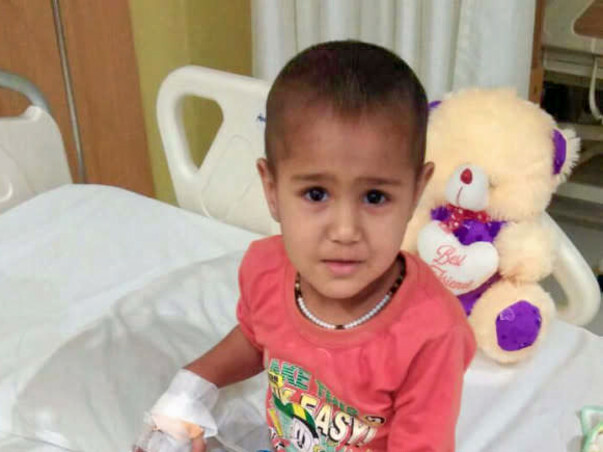 Any small contribution is appreciated and may help to ensure Aarohi see her fourth birthday. Arohi love to dance and play with dolls. We at NDCHRC would like to request one and all to please support her and the family as the family is not able to arrange funds for the treatment and I am sure with our help she can get cured and can lead a normal life which she deserves. With a heavy heart, I regret to inform you that Aarohi is no more. She was going through a long fight with both her kidneys, and she collapsed last night despite the best efforts from the doctors and the family. All the funds were utilized for the treatment and the residue was given to the father. Please pray for her soul to rest in peace. Thank you all for the love and support! Dear well-wishers and kind hearted Donors! Here is an update on Arohi. A brave little girl who is just 4yrs now doesn't know what's happening with her. Since 2 yrs she is been only travelling to places for treatment and now finally is in Mumbai at SRCC Hospital for Children where she got her only leftover kidney operated and removed. She is on Dialysis and medication. 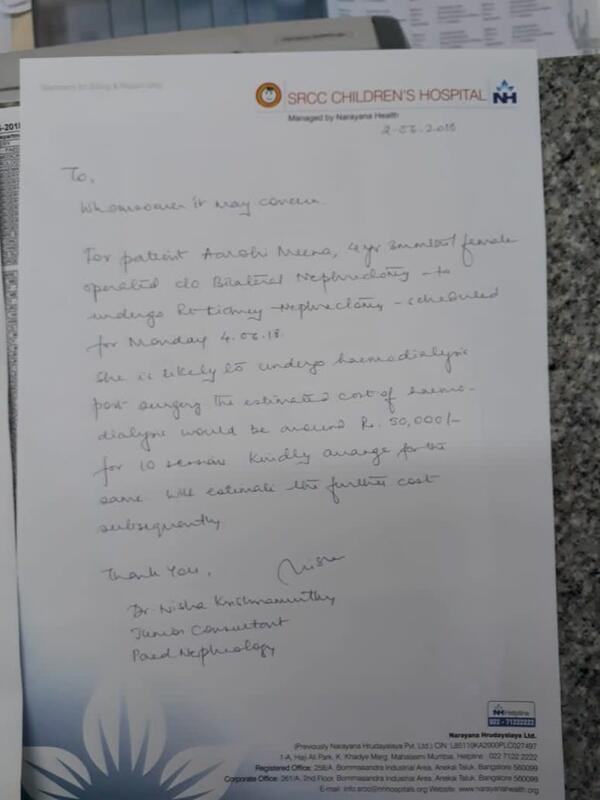 As per the doctor it is informed that for next 6-7 months she needs to be on dialysis which will be costing her Rs 45,000-50,000 per month and in between can find a donor for kidney transplant and transplant will cost around 5-6 lacs including her stay medication and other protocols. So dear well Wishers and kind hearted Donors I request one and all to please help her in getting treated and getting her kidney transplant done. I know we all can do so kindly spread it to your links and known people and try to get as much as help funded for her. Together we can! She wants to live a life and be like other kids so please kindly help her. Thank you. 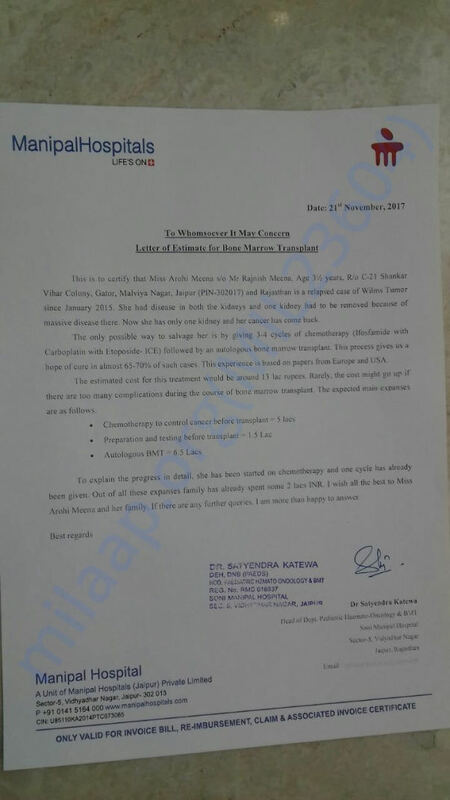 Just an immediate update is Aarohi who was been treated at Manipal Hospitals and then later at TATA @ Mumbai and Medanta cudnt cope up well all the hospitals and now the situation is her only kidney which was detected with cancer needs to be removed as per the Doctor advise at all places the family went to inquire and di the treatment to save her. 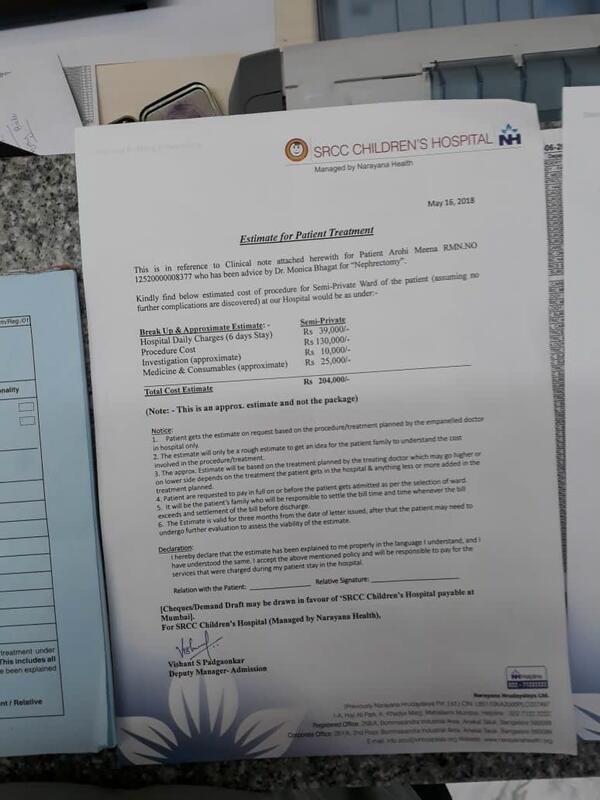 Finally now have landed up at SRCC HOSPITAL the venture of Narayan Hospital at Mumbai are getting the operation done tomorrow and for which the total charges is estimated 2 lacs and 4 thousand . As you all know that the parents are not in a position to get her treated and with help of you all kindhearted donors and well wishers trying to help the family and Aarohi so please come forward and help her to live a life. I request on behalf of Aarohi to support her and help her in getting treated. The amount so far generated was been used for her earlier medication and treatement at Manipal, TATA and Medanta out of which 2 lacs for been paid via me to the parents . Now the challenge is about the funds for the ongoing treatment and further post treatemnt expenses. So Dear friends please help her to get treated .I know we all can help her for sure.